The increasing popularity of bicycling as a sport and a means of transportation have made bicycles an easy target for thieves. It is estimated that over 1.5 million bicycles are stolen every year. Most bike thefts can be prevented by properly securing the bicycle with an adequate lock to a fixed object such as a bicycle rack. The majority of stolen bicycles have been left unlocked, locked only to themselves, or secured with a lock too weak relative to the value of the bike. U-locks are recommended, but a knowledgeable thief can easily defeat even these. Bicycle registration programs can be another layer of protection to bike theft, but may not always a deterrent. Some cities may have a bike registration program or ordinance requiring bikes to be registered through the city or police department. 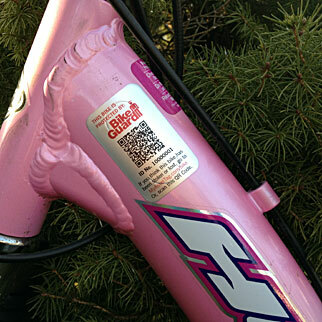 The Arizona Crime Prevention Association is partnering with BikeGuard, a free bicycle registration program providing free Asset Tags to assist in identifying your bicycle. Many cities may provide a similar service, but in most cases, the program is exclusive to the city. This makes it difficult for law enforcement in other cities or states and citizens to obtain owner information when the bike is found unless the bike has been reported stolen and the serial number was provided to law enforcement. 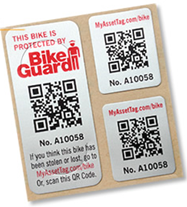 The free BikeGuard registration program is another layer of protection and if the bike is ever lost or stolen, a scan of the BikeGuard asset tag will find you for free. The Arizona Crime Prevention Association supports bike registration programs, but your safety and privacy is always a concern. We recommend when you create an account with BikeGuard, you select the options to keep your personal information private. Visit, BikeGuard for more details and to register your bikes. Click here to view/download the flyer, BikeGuard flyer PDF. If you would like to use our brochure for your agency or organization, Download Here.